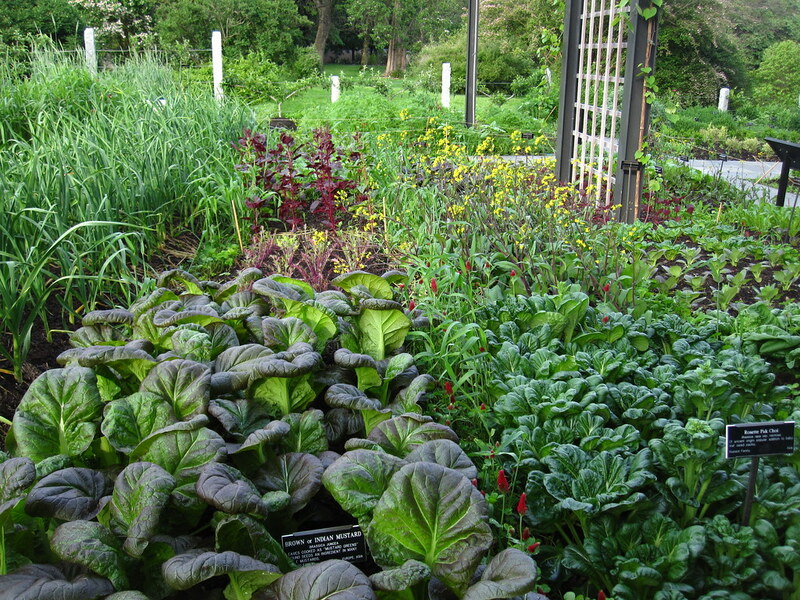 With its small orchard and beds devoted to food and utilitarian plants from all over the world, the Herb Garden is both educational and lovely. Here, a variety of food and medicinal plants grow in decorative beds or climb trellises and other supports. Pole beans grow up corn stalks in traditional companion plantings, espaliered fruit trees line the garden's border, and colorful cabbages grow as big as beach balls within the shaped hedge of a knot garden. Cherry, apricot, and apple trees blossom in spring as early salad greens emerge, and summer sees later flowers, ripening berries, and lush cole crops. The fall harvest brings chile peppers, apples, and pumpkins and other squashes like you've never seen. There are also cold frames, window boxes, a composting area, and other displays to inspire home gardeners. Interpretive signage highlights the origins and uses of food plants and offers practical gardening advice. A beautiful array of fall pumpkins and squashes. Photo by Blanca Begert. An artichoke plant in flower. Photo by Lee Patrick. A chile pepper cultivar: Capsicum annuum ‘Sangria’. Photo by Alvina Lai. Plums in August. Photo by Morrigan McCarthy. Ripening heirloom tomatoes in summer. Photo by Alexandra Muller. 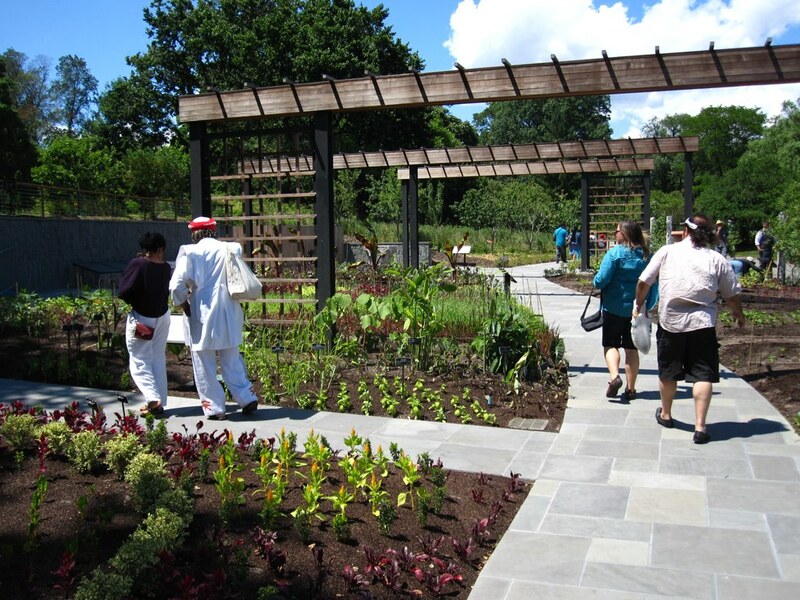 Visitors enjoy BBG's new Herb Garden on its first day of being officially opened to the public. Photo by Rebecca Bullene. The Herb Garden in spring. Photo by Rebecca Bullene. 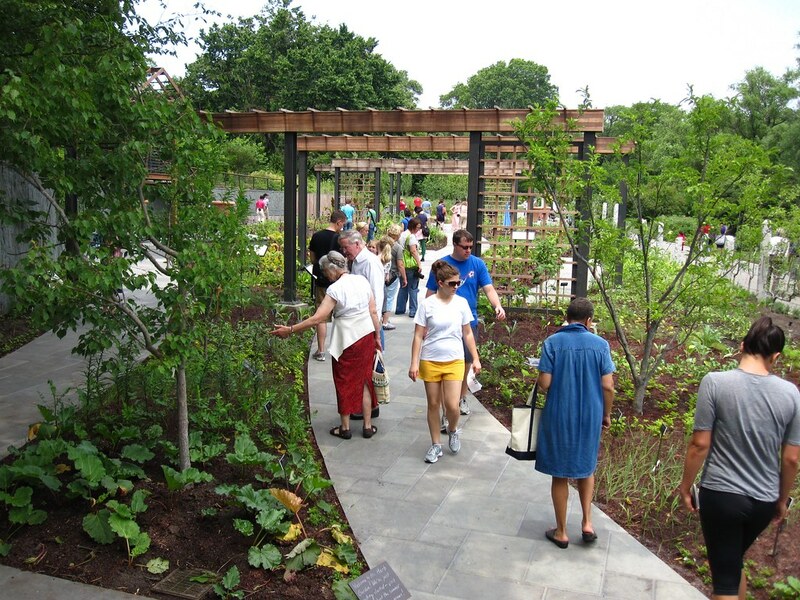 Visitors enjoy the recently opened Herb Garden on Bee-Day.